Zhu Xi (朱熹, 1130-1200) was a Song Dynasty (960-1279) Confucian scholar who became the leading figure of the School of Principle and the most influential rationalist Neo-Confucian in China. 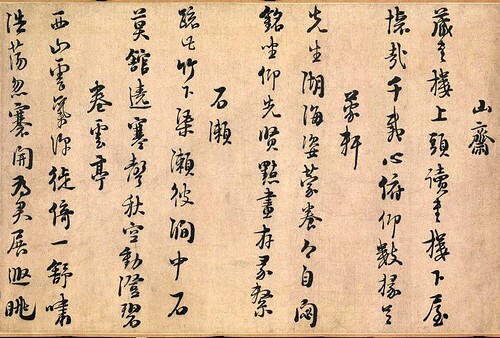 His contribution to Chinese philosophy included his assigning special significance to the Four Books (四書) [the Analects of Confucius (論語), the Mencius (孟子), the Great Learning (大學), and the Doctrine of the Mean (中庸)], his emphasis on the investigation of things (格物), and the synthesis of all fundamental Confucian concepts. 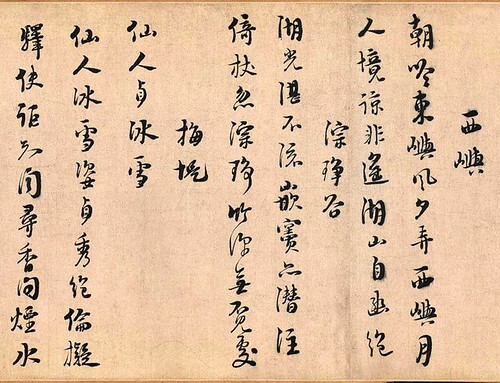 Zhu Xi’s philosophy emphasized logic, consistency, and the conscientious observance of classical authority, especially that of Confucius and his follower Mencius. 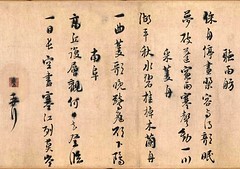 Zhu Xi held that the cosmos has two aspects: the indeterminate and the determinate. 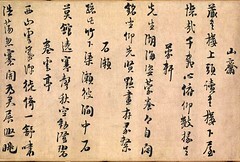 The indeterminate, or li (理), is natural law and determines the patterns of all created things. This law combines with the vital psychophysical qi (氣) to produce phenomena having form. In human beings the li, manifested as human nature (性), is essentially perfect, and defects—including vices—are introduced into the body and mind through impurities of qi, or energy. Human beings may eliminate their mental imperfections through study of ethics and metaphysics. 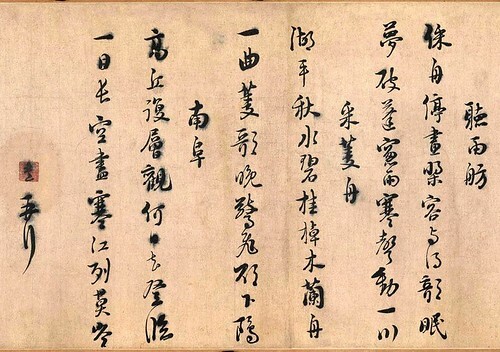 Though his ideas never went unchallenged, Zhu Xi’s neo-Confucianism long dominated Chinese intellectual life, and his commentaries on the Four Books (四書) became required reading for all who hoped to pass the civil service examinations. His intellectual influence was also paramount in Korea, and his ideas won wide acceptance and official support in Tokugawa Japan as well. 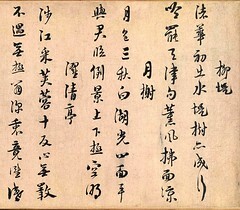 The calligraphy of Zhu Xi had been acclaimed as acquiring the style of the Han and Wei Dynasties. He was skillful in the central tip, and his brush strokes are smooth, round and steady. The movements of his strokes flow without any trace of abruptness. Indeed, his calligraphy possesses stability and elegance in construction with a continuous flow of energy. Without trying to be pretentious or intentional, his written characters are well-balanced, natural and unconventional. 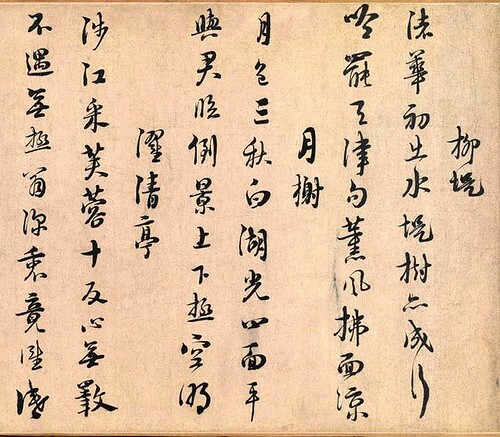 As he was a patriarch of Confucianism philosophy, it is understandable that his learning permeated in all his writings with due respect for traditional standards. He maintained that while rules had to be observed for each word, there should be room for tolerance, multiplicity and naturalness. In other words, calligraphy had to observe rules and at the same time not be bound by them so as to express the quality of naturalness. 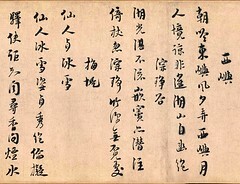 His calligraphy had been highly esteemed throughout Chinese history.